DOW only down 28 but the RUSSELL down the equivalent of 250 DOW points. The MIDCAPS down the equivalent of 150 DOW points. Advance/declines were gross. More and more names broke the 10 week/50 day average. THE POPULAR INDICES WILL NOT BE ABLE TO TAKE TOO MUCH MORE OF THESE KINDS OF DAYS! Pixie dust needed! 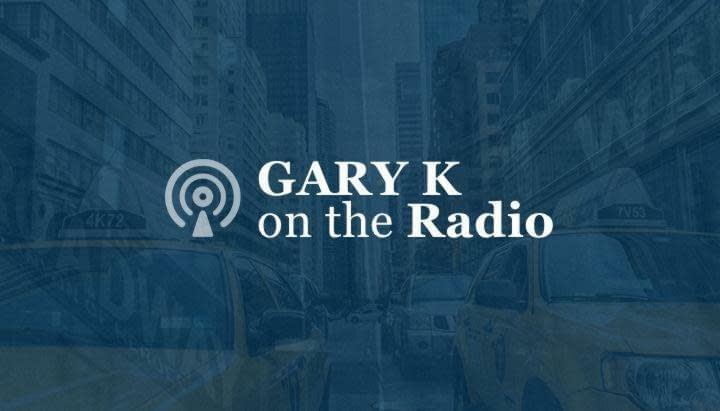 http://garykaltbaum.com/wp-content/uploads/2014/08/ipo-market.jpg 500 750 aaronmat-admin http://garykaltbaum.com/wp-content/uploads/2019/01/gary-k-logo7-01.png aaronmat-admin2014-09-30 18:33:282014-09-30 18:33:28AND MORE DETERIORATION! I CAN’T KNOCK IN A 5 FOOTER! http://garykaltbaum.com/wp-content/uploads/2014/09/Christopher-Meyers.jpg 629 1248 aaronmat-admin http://garykaltbaum.com/wp-content/uploads/2019/01/gary-k-logo7-01.png aaronmat-admin2014-09-29 09:43:322014-09-29 09:43:32I CAN'T KNOCK IN A 5 FOOTER! A massive amount of leverage and margin are now in the system. When have we seen this before? 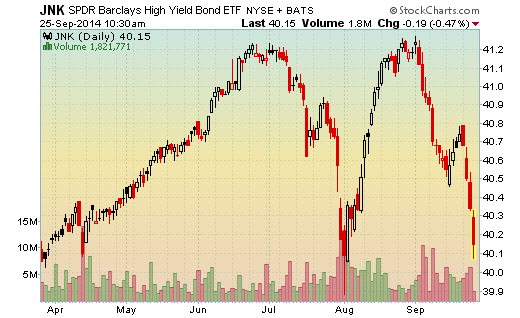 You just may want to look at the chart of high yield bonds over the past few months. A ton of secondaries and IPOs culminating in a bunch of “no sales” IPOs and the recent Alibaba IPO at a measly $230 billion market cap with $8 billion in sales. Complete underperformance by the small caps versus the large caps. The amazing lack of new yearly highs and the growing new yearly lows. Recently, one day off the market highs, there were about 50 new highs but 250 new lows in the market. A complete lack of bears. The growing underperformance in Europe, Emerging markets, Brazil, Russia, China and many other areas around the globe. We can now add in the mauling of the high-yield bond market. Remember, we think the biggest bubble in in the income markets as the Fed has had its way with their rigging and manipulation. We actually can go on and on but the main point is that tops take time…and maybe the market has some more time left but the termites continue to grow. The most important point is that more stocks and sectors are going onto the negative side of the ledger. This is amazing with a few of the major indices just a stone’s throw away from new highs which tells us that underneath the surface, things are not well. We do believe you can still put points on the scoreboard on the long side but it is getting tougher as we count less than 50% of all stocks remaining in good technical shape and in the small-cap arena, it is much lower…thus the issue with the Russell 2000 and other small cap areas. We can now add that the mid-caps are underperforming badly also. Again, one of the main technical characteristics of a topping market is the large cap indices holding up better while the underbelly goes bye-bye. This is exactly what we are seeing now. WHAT WE ARE WATCHING FOR! Simply put, if the large cap areas start breaking the 50 day average, that would be the next shot across the bow as it would tell us the big boys are following suit. 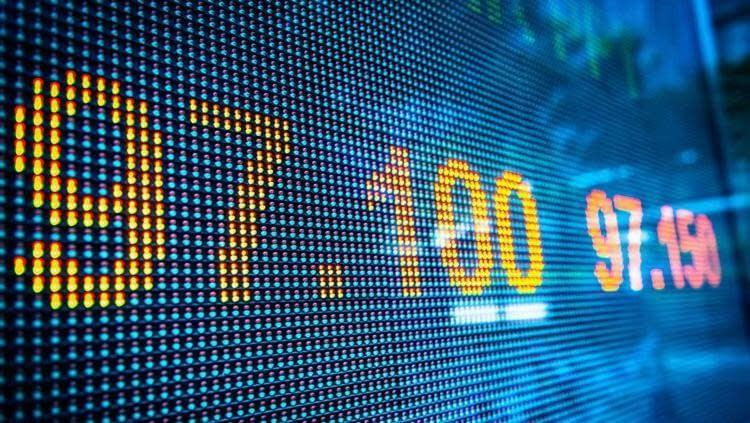 We started to get some of that last week but Friday’s action had support being held…FOR NOW!The DOW,S&P,NASDAQ,NDX and TRANSPORTS are just a smidge above and are to be watched closely as we head into October. We are also watching the BIOTECHS, SEMIS and the FINANCIALS as they have acted best and held best on any pullbacks. If they go, we suspect market goes. We will have the long version over the weekend…but let’s just say Thursday was a yonking…simple as that. You already know what we have been saying for months…the divergences, the lack of new highs and all that crap. Things just worsened. But before everyone gets all out of sorts, not much has changed. Just that the large caps are starting to teeter. Teeter but not broken. Shorter-term sentiment has turned decidedly bearish which means a bounce could be in order…especially into end of quarter. But short term is the trees. The forest is another story. We will go over the forest over the weekend. http://garykaltbaum.com/wp-content/uploads/2014/09/light-forest.jpg 1080 1920 aaronmat-admin http://garykaltbaum.com/wp-content/uploads/2019/01/gary-k-logo7-01.png aaronmat-admin2014-09-26 05:48:492014-09-26 05:48:49THURSDAY SPLAT! END OF QUARTER PUMP TURNING INTO END OF QUARTER DUMP! It is early in the day but ugly does not describe today’s action. Screens are beet red…and one thing really starting to stand out. It is the mauling of the high-yield, junk bond arena. We have yapped forever here at this area as the most mis-priced and distorted market brought to you by Mr. Bubble Bernanke…which fed into Wall Street doing their normal leveraging and reach for yield. http://garykaltbaum.com/wp-content/uploads/2014/09/bubble-bernanke.jpg 1024 1536 aaronmat-admin http://garykaltbaum.com/wp-content/uploads/2019/01/gary-k-logo7-01.png aaronmat-admin2014-09-25 07:15:592014-09-25 07:15:59END OF QUARTER PUMP TURNING INTO END OF QUARTER DUMP!